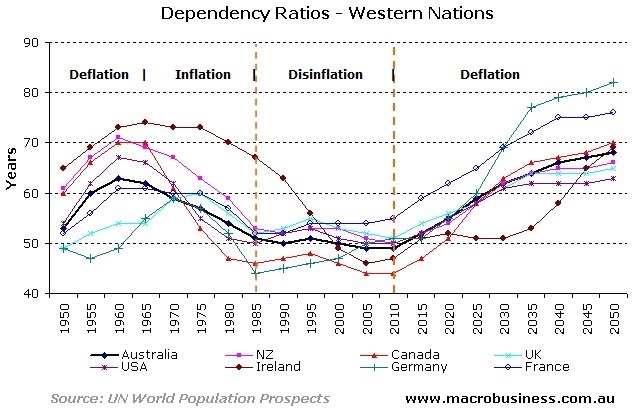 If the combined demographics of the major nations are exerting an overall deflationary pull on the global economy, then we ought to see clues in the data. 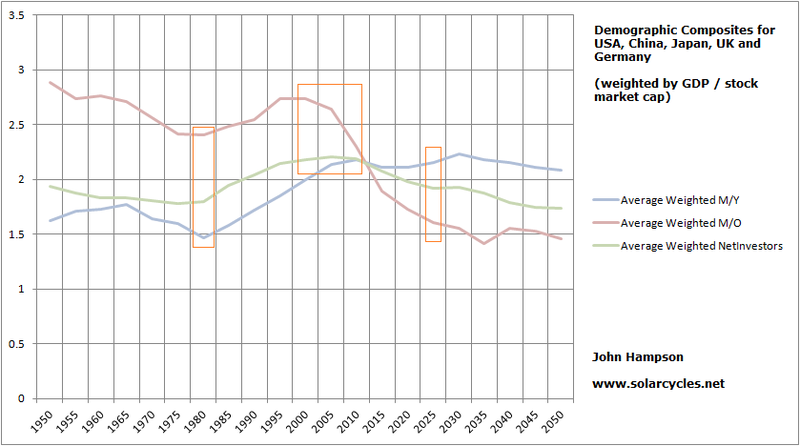 Broadly-speaking, USA demographics began a downtrend around 2000, Europe around 2005 and China around 2010. Therefore, the biggest pull has been in place since 2010 or so. Now let me outline two scenarios going forward. 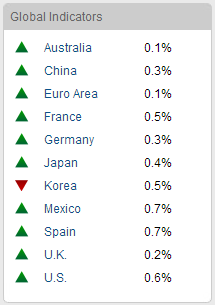 The first is that the world economy picks up in the second half of 2013. Positive effects from the round of further rate cuts, plus the drop in input prices through recent softer commodities push most of the above indicators upwards and away from danger. Demographics continue to exert their influence in keeping global growth weak and unimpressive, but growth is nonetheless maintained and improves, at least temporarily. 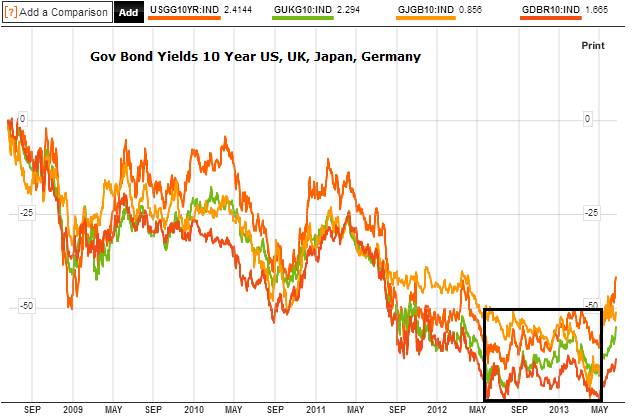 Asset markets would be the primary beneficiary, with stocks most likely winners again, under low growth low rates. Commodities should also get a boost, in a mean reversion away from oversold and overbearish, and on improved global demand. If commodities then gained too much traction, the risk would be of oil and other key inputs tipping the world into recession given global growth is fragile due to demographics. The second scenario is that the combined demographic trends of USA, China and Europe, that are now collectively at their most potent, drag those indicators above negative and the world economy tips into recession under deflationary momentum. 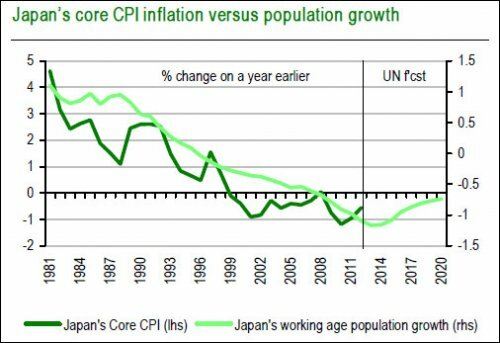 So no spike in commodities, no excessive inflation or subsequent tightening, but rather like a global version of Japan in the 1990s, whereby no central bank action could prevent the demographic waves from cutting spending and investing. Such a deflationary shock is the scenario Russell Napier is predicting. QE has failed to produce either strong or self-sustaining growth, and growth in emerging market reserves has reversed, limiting their ability to deal with another deflationary shock. Inflation is the only real solution for the indebted developed country governments, to inflate the debt away, yet they cannot induce the necessary inflation, due to the combined demographic downtrends. If the world was to tip into a deflationary recession, then I expect a panic would ensue and stocks would sell off hard. The perception would be that despite the billions spent on propping up the economy, it had all failed and central banks were powerless. The massive debt that had been racked up in trying to stimulate and support was also now growing even bigger under deflation – a double failure. Of course, demographics would be the culprit, and eventually by around 2020 the trends would have improved in USA and China and others sufficiently to give the global economy traction again, but not before a massive sell-off in assets. Stocks look to be rising again since the new lunar positive period, so I am hopeful my preferred scenario of a re-test of the highs will ensue. If this is a topping process in equities then we may then see the historically normal switch to outperformance in commodities. 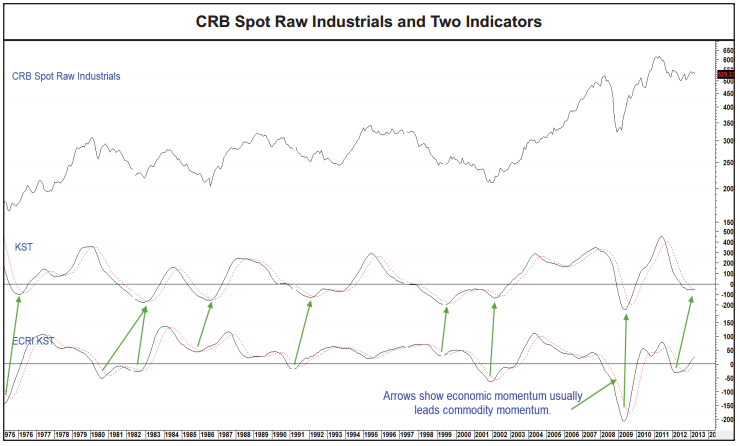 Certain indicators, such as Martin Pring’s, suggest commodities are about to gain traction again, and given they have been oversold and overbearish for some time now, a mean reversion would make sense. If commodities were to truly rally and then top out after stocks in the normal sequence, the whole momentum move for commodities would have to happen fairly quickly. This could happen through solar maximum inspired speculation, but until and unless commodities become the money target then this scenario remains theory for now. If commodities do not take off, but rather leading indicators weaken and provide a negative divergence to the equities high retest, then the deflationary scenario could be unfolding. I would expect bonds and cash to be beneficiaries to some degree, whilst equities fall hard, and I believe gold would rally again, as the anti-demographic go-to. Once again I could see a solar maximum inspired speculative peak, this time in gold. I have to end on the scenario not mentioned. 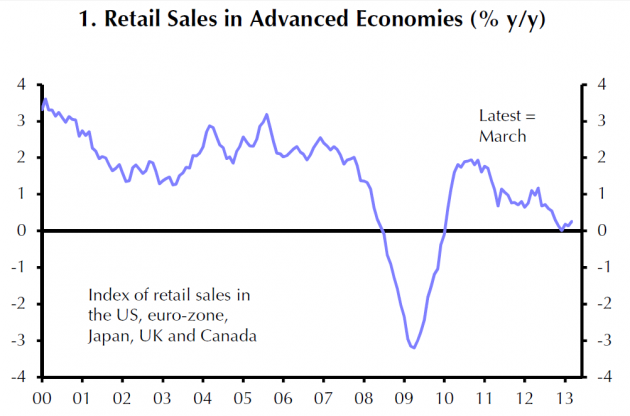 Central banks continue to tease enough growth in the economy to keep stocks in favour. 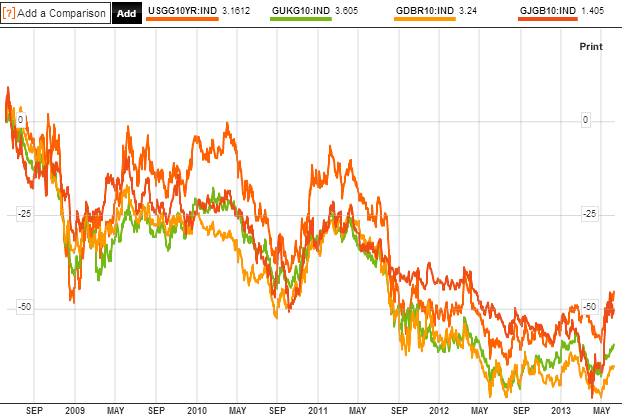 Not too much to inspire inflation and commodities momentum. Not too little to slip into deflation. Sustained weak growth in the economy and sustained easy money conditions, with the latter inspiring continued flows into equities, and perhaps a solar maximum inspired speculative peak happens in stocks. Under this scenario I would expect Japanese equities to outperform, under their belated demographic catch up, full-on central bank push, and as an energy importer benefiting from the subdued commodity prices. If this scenario were to be the theme of H2 2013 then I would expect renewed economic weakness in 2014 as the recent round of easing wears off again, and demographic forces continue to pull. Would we then slip into deflation at that point, or could yet another round of central bank interference once more have the required effects? It comes down to whether central banks are really in control here. Are they successful in their ZIRP and QE efforts? The evidence suggests not, as they cannot induce inflation nor sustained growth. 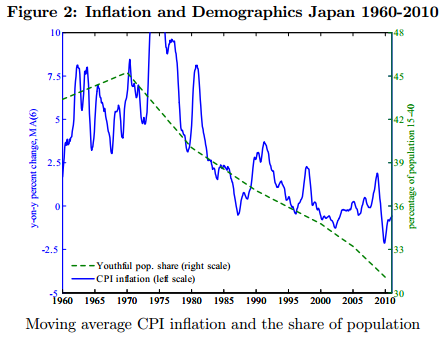 Japan’s central bank could do nothing to overcome their demographic downtrend in the 1990s. Central banks can only encourage or discourage through their tools, they cannot force. With US, Chinese and European demographics united down in this decade, I think that’s too potent a combination for central banks to overcome. It’s just whether they can keep it at bay for now. 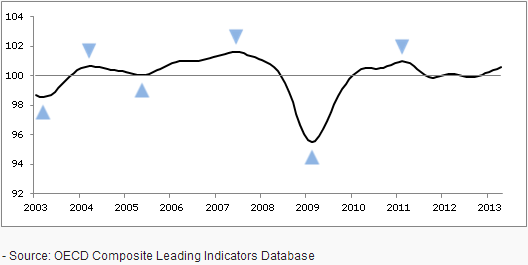 So let’s see how leading indicators develop, and whether commodities can attract a rally or not. Timing the solar peak remains troublesome as the experts cannot agree, but assuming it remains ahead, then I expect it still has a key role to play here. 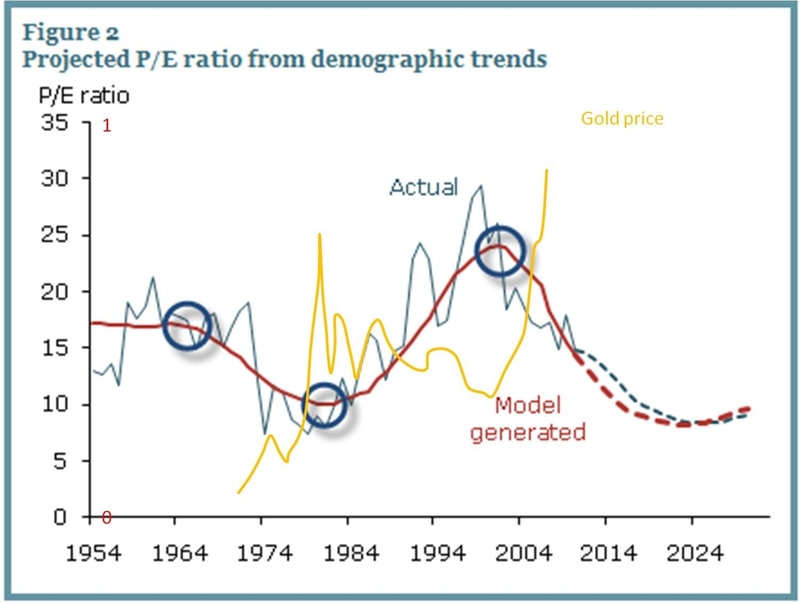 I expect a sunspot-associated speculative peak, and maintain the most likely asset to benefit is gold, as demographics are anti-equities, anti-t-bonds and deflationary. If it isn’t gold, then the combination of easy-bubble-making monetary conditions and solar inspired speculation should inspire a moon-shoot in another asset. I have enlightened myself again this weekend, and I feel just in time. More outlook changing research. These last 4 months or so have been a real leap forward in understanding, personally. So yes, some of my views have changed, parts of the site need updating, but let’s get to the important. 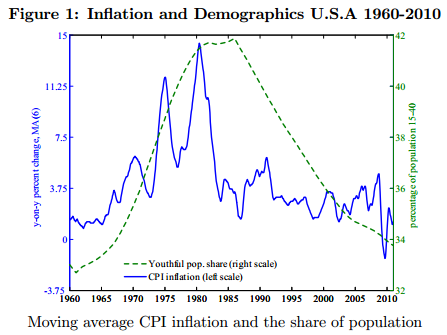 Demographics not only dictate ‘secular’ bull and bear markets in stocks and real estate, but also play a major role in inflation, disinflation and deflation. It is labour force growth or shrinkage playing a key role in price inflation. A swell of people aged 15-20 entering the workforce works up price inflation through spending, whereas more people entering old age relative to the work force is disinflationary through saving and disinvestment. There are correlations with inflation in labour force growth (15-60), young labour force percentage (15-40) and dependency ratios (inverted – old and young versus the working population), all of which are approximations of the same idea. It’s another simple but powerful mechanism, in the same way swells in the ‘investment’ age group produces equity bull markets. 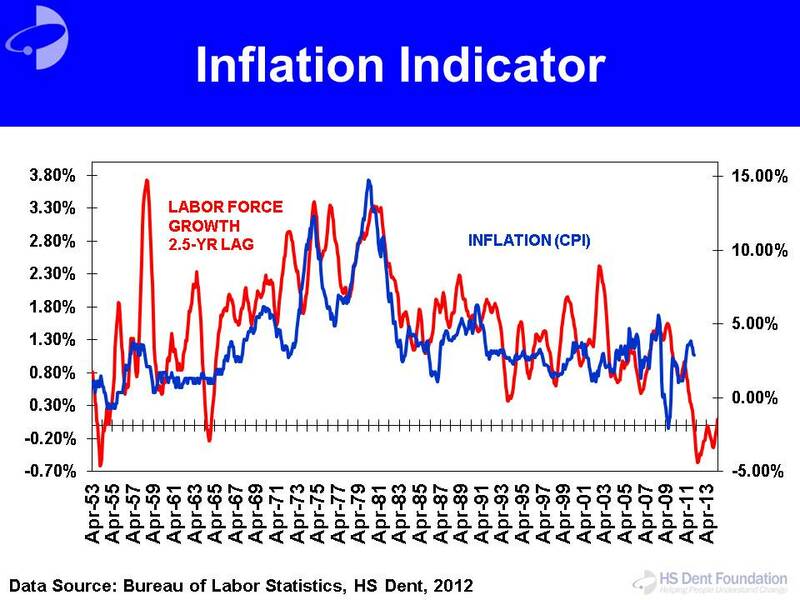 The charts suggest the USA should be tipping from disinflation into deflation. That is, if we assume the Fed is powerless to stop it. 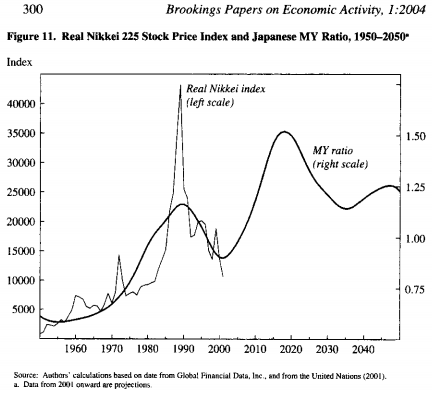 This explains why ZIRP and QE have failed to bring about inflation in Japan and now the USA. 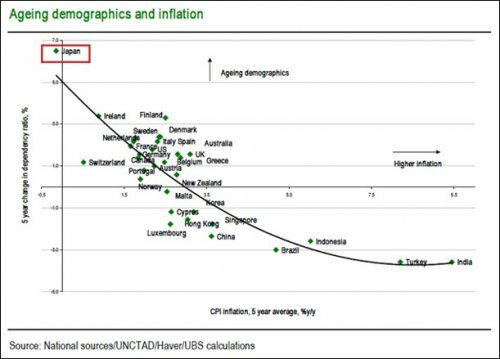 These countries want to inflate, but the demographic trends mean the public just won’t spend sufficiently in the economy for it to happen. For the majority of the major nations, this is a problem going forward, as the demographic trends persist and worsen. For the global economy, this is a problem, because the combined GDP of Brazil and India and other smaller positive-demographic countries is much smaller than the combined influence of the USA, China and Europe. So what’s likely to happen? 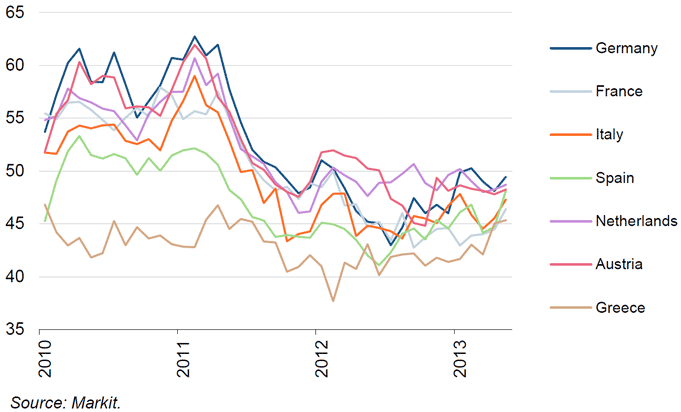 The central banks of these countries are largely pushing on a string. They can’t force spending and investment, they can just use ‘carrot and stick’ tools to encourage spending and investment and discourage saving and cash. 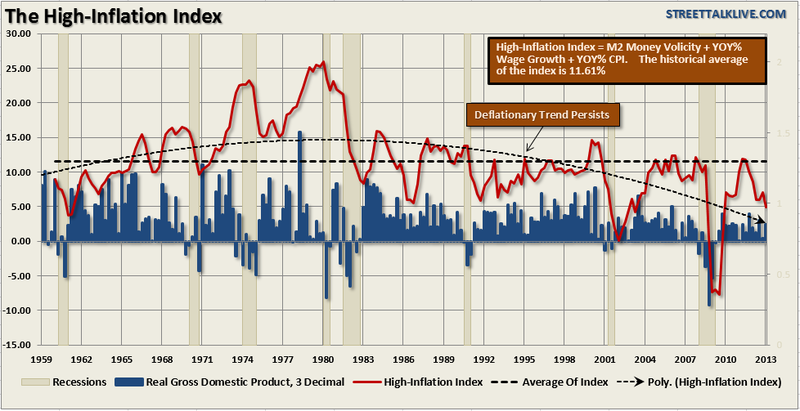 The evidence suggests that disinflation should continue. 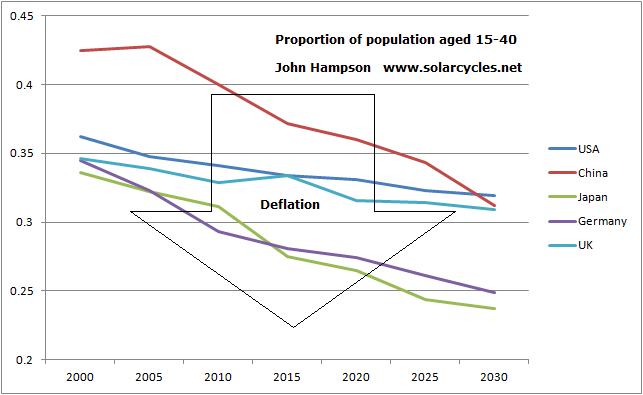 The risk is that disinflation turns into deflation, as the demographic trends suggest. The global economy is at risk of falling into a new recession, or even depression. 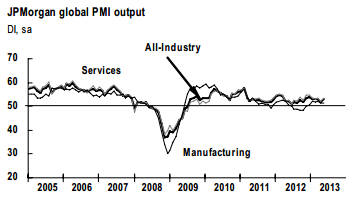 It explains why the recovery since 2009 has been spotty and weak. The central banks will likely have to persist with ZIRP and QE and perhaps also deploy other unorthodox tools, but which would likely have the same lack of potency. If deflation takes hold, then debts would grow, savers and currency holders would be beneficiaries, and investment would become unattractive because future prices would be lower. Risk asset markets would fall. So why are equity markets so strong currently? We have disinflation and low growth, together with the ZIRP and QE easy money conditions. Whilst the former two conditions hold, then speculation is encouraged by the latter two. It would take a plunge into recession and deflation to generate the exodus out of stocks, and it is such a development that a couple of analysts that I respect are touting (e.g. Russel Napier, using the Q ratio, predicts the SP500 to bottom at 400 in 2014). With this new research, I now understand why. Stock market participants have increasingly borrowed and leveraged in the market. 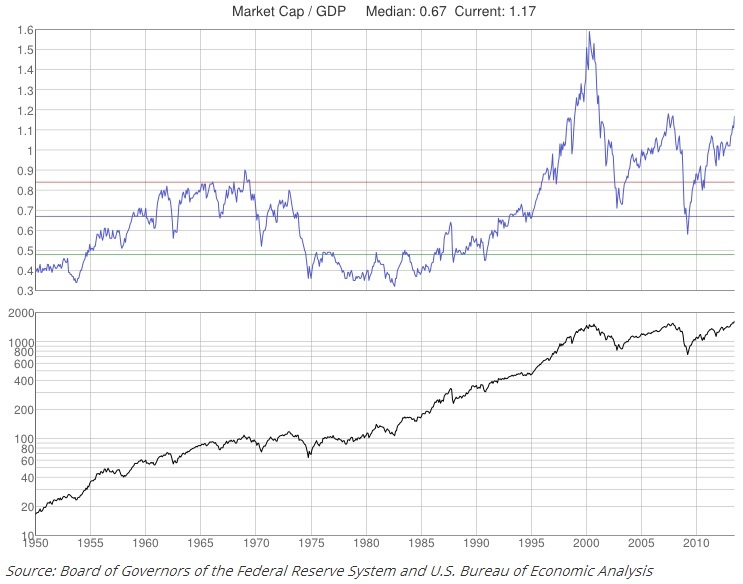 So it’s not more investors but the same investors buying more and more on credit, and as the graphic shows, when margin debt reached over 2.5% of GDP previously, the stock market fell into a cyclical bear subsequently. It suggests a fair p/e of around 10 by next year. As of Friday’s close the p.e was 18.4. A shrinking of p/e can be achieved either by stocks holding up nominally but strong inflation eating away at the valuation, or it can be achieved by stocks tanking under no-inflation or deflationary conditions. By the demographic projections further up the page, the second option appears likely. This would also mean US stocks could be in for severe falls ahead. The next two years is a particularly good demographic period for Japan as middle-old and net investors measures also rise. 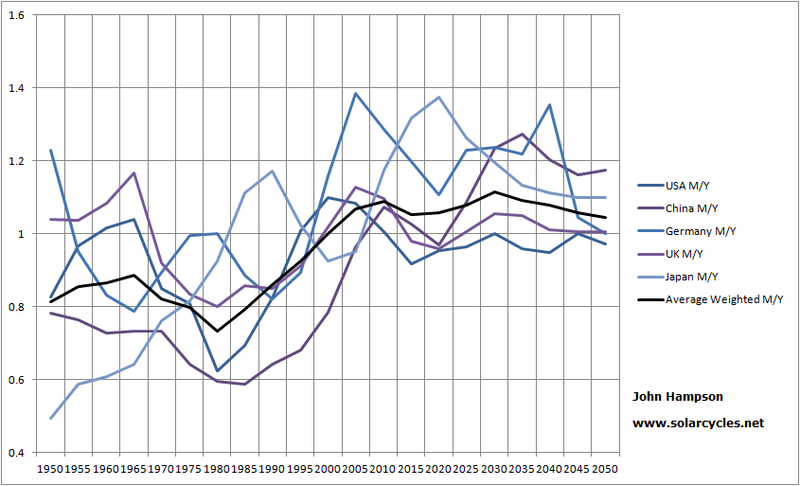 Plus Japan is playing catch up to demographic trends that turned up as of around 2002. I maintain that Japanese stocks took off then but were pulled back by the global crisis of 2007/8. So, the question is whether they would again be dragged back by a new global recession and a stocks bear in most of the major nations. I don’t think they would be immune, but I would still expect them to outperform and eventually deliver their demographic fulfillment. Plus, there is a chance of a fast speculative boom. Current monetary conditions encourage bubbles, and the new Japanese government has upped the ante by saying it will buy equities as part of its reflationary policy. With speculative behaviour also at peaks around solar maxima, I think there is a chance Japanese equities could go crazy, and so I will maintain long Japanese equities and add on any further retreats. For the US and Europe we see a change in demographic trend has taken place over the last 10 years which should see outflows from bonds going forward, and yields therefore rising. The US changed trends first, which suggests treasuries are belatedly falling to trend now, and that the flows out of treasuries are justified. If a sharp cyclical bear does occur in equities, then we would have a similar deflationary shock to 2008. In that experience, most assets were sold off as people needed to raise cash to pay for losses elsewhere. Gold did not escape. It was government bonds that were the recipient of the money flows. Would they be this time? You may read that in the 1970s gold rose as an inflation hedge, in the 2000s gold rose under disinflationary conditions, and gold also performed as a deflation hedge in 1933. Gold is touted as a hedge against systemic risk and financial market instability, as hard currency or as a store of value under conditions of negative rates or currency dilution. What I would suggest is that gold is the go-to, the default investment, under certain demographic conditions, i.e. ‘negative’ demographic conditions. When demographic trends are counter equities and real estate and government bonds then gold becomes attractive by default. 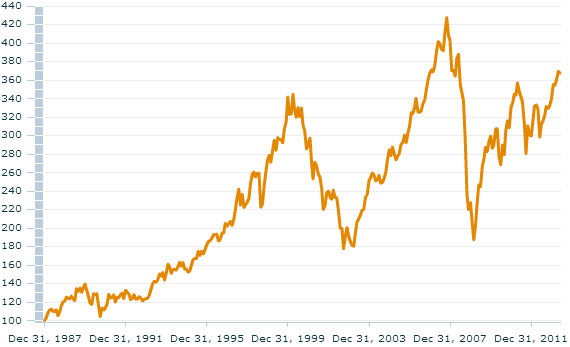 This ‘last resort’ status is reflected in gold’s real performance over time, namely it goes nowhere in the long term. When equity p/es are declining under m/o demographics, and stock market interest is in decline due to m/y and net investor demographics, but labour force growth demographics are inflationary, then we have disinvestment in the stock market but price inflation in the economy. This was the 1970s, and reflects the broad collective downtrends in demographics amongst the major nations at the time. Gold and commodities outperformed. When equity p/es are advancing under m/o demographics, and stock market interest is increasing due to m/y and net investor demographics, and yuppie/nerd demographics are pro bonds, and labour force growth demographics are price disinflationary, then we have investment in the stock market and bond market and price disinflation in the economy. This was 1980-2000 for most of the major nations, although Japan changed demographic trends circa 1990 and went its own way. Equities and bonds outperformed. 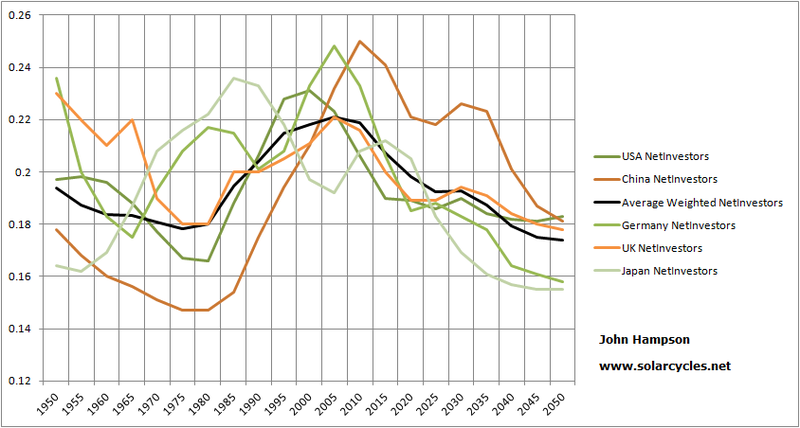 From 2000 to current, we saw some divergence in demographics. 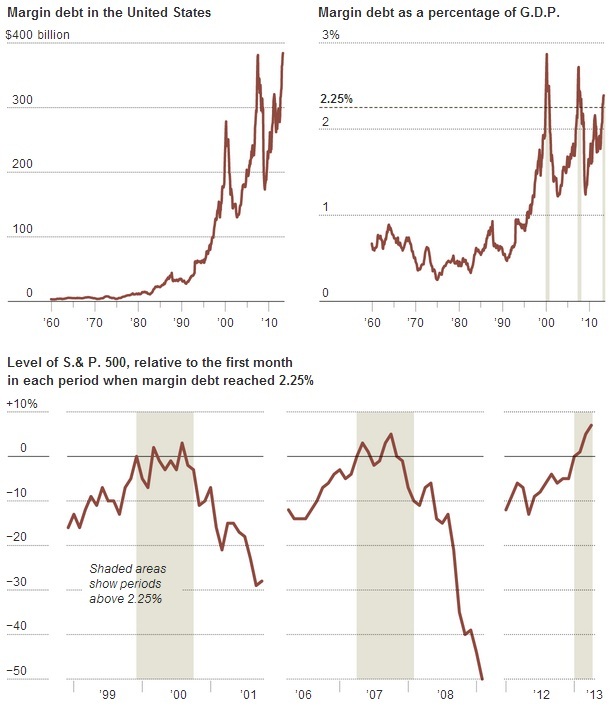 For the USA, equity p/es were declining under m/o demographics, stock market interest was in decline due to m/y and net investor demographics, and labour force growth demographics were disinflationary, so we had disinvestment in the stock market (secular bear market) and price disinflation in the economy. 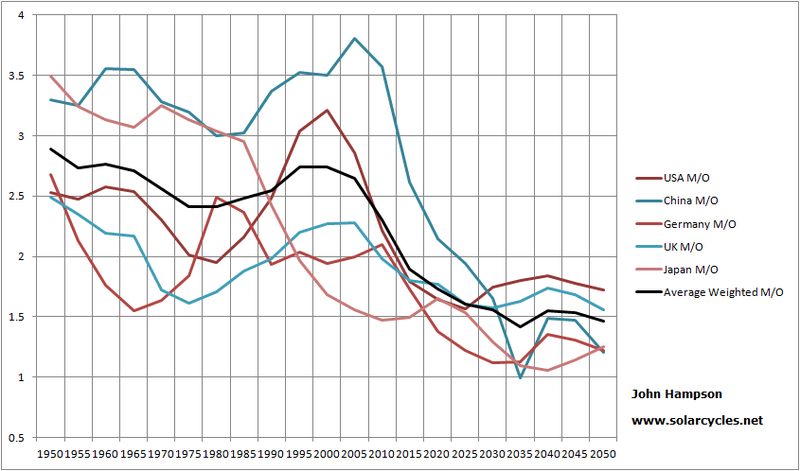 However, Europe largely retained positive demographic trends until mid-decade and China until around 2010. China’s conditions were price inflationary, and as the biggest consumer of commodities, commodities had a demand story. Some have suggested that gold performed well in the 2000s under disinflationary conditions, i.e. 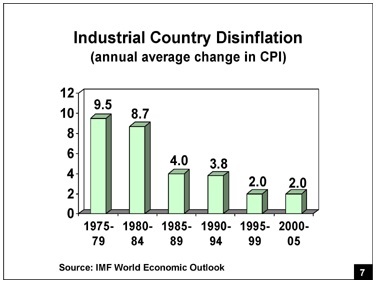 that it is a beneficiary under disinflation, which may be true. However, the picture is muddied because of the price inflationary China demographics which could equally have been the story for gold’s rising, partnering with commodities again. Which brings us to now and the next few years ahead. We see more united demographic trends again. 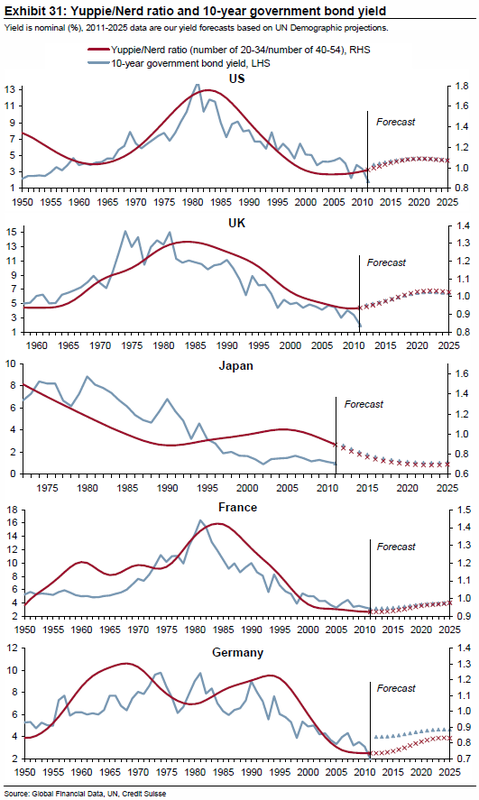 For the USA, China and Europe, equity p/es should be declining under m/o demographics, real estate interest should be declining under m/o and dependency ratio demographics, stock market interest should be in decline due to m/y and net investor demographics, yuppie/nerd demographics should be counter government bonds, and labour force growth demographics should be price deflationary. 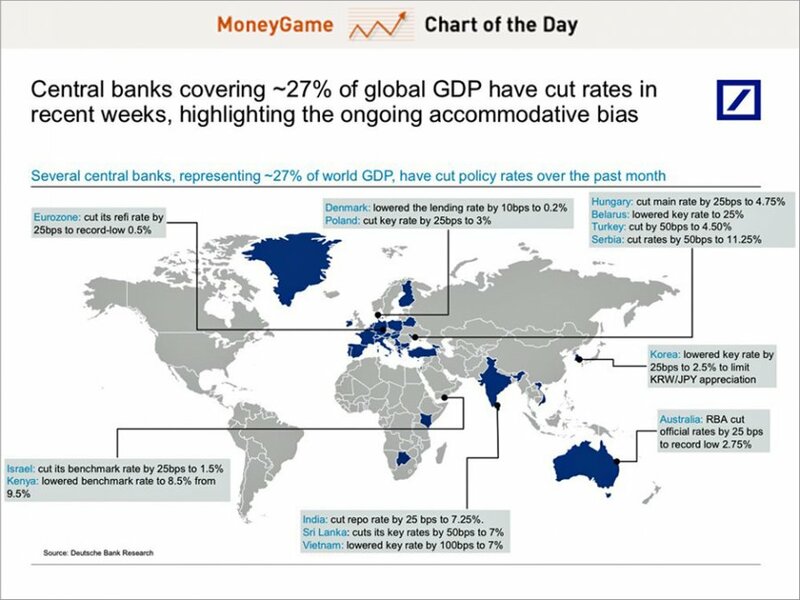 So we should see disinvestment in the stock market and bond market and price deflation in the economies of these countries. What would be the winner under such conditions? I believe it has to be gold, as the default, go-to asset again. I suggest this would be the difference to 2008, as government bonds have changed trends and with ZIRP still making cash unattractive, money has to flow somewhere. If the solar maximum is ahead this year and this deflationary shock happens 2013-2014 with gold the recipient, then we would once again produce a secular peak close to the solar maximum. What about commodities? 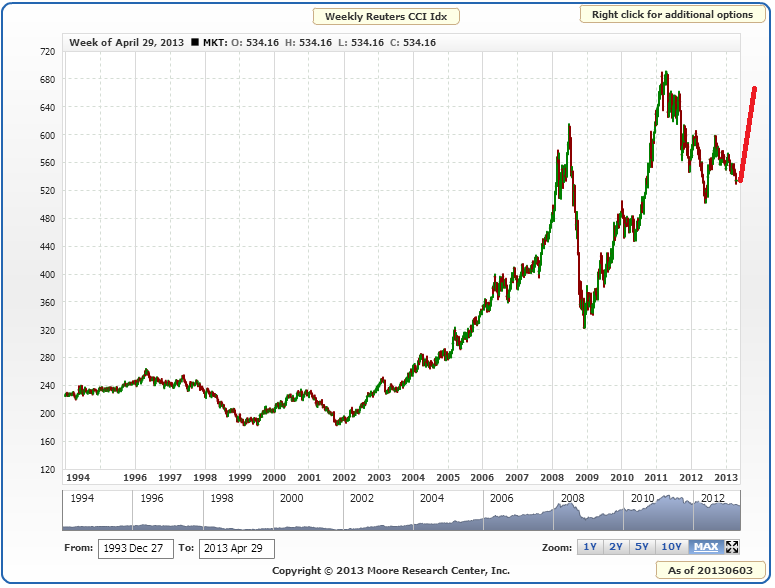 I am not sure if commodities as a whole would be winners in such a deflationary shock. I have my doubts, because the demand story should be on the wane, and they are a class for inflationary trends. I believe the question is whether they collectively would become a speculative target, rather than an economic demand target. If equities are close to topping then commodities could go outperform here in the historically-usual pattern of topping last as the economy rolls over. However it would be done so most likely on speculative interest, rather than tight inventories. Geopolitical or climate events could play a part, particularly as the solar maximum has historically inspired protest, revolution and temperature peaks. The solar maximum has also historically seen speculative climaxes, so the potential for commodities as a class to rise is possible, particularly if oil took off. However, I am now very much open to the alternative, which is that the price deflationary demographic trends, particularly in China, take down commodity prices from here, and precious metals perform alone. I am therfore going to refrain from adding any more to my long commodity positions for now, and watch developments. In short, I think calls that gold’s bull market is over are premature, as it is the counter-demographic go-to asset. 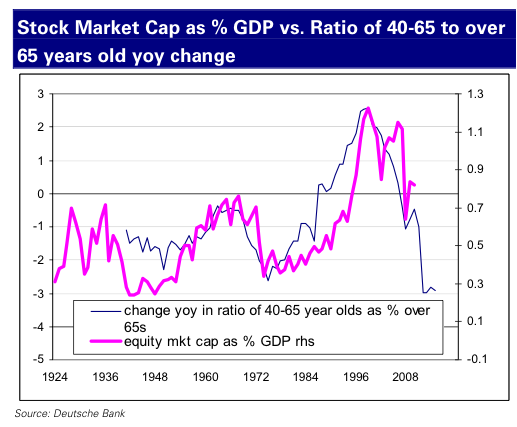 Equities are on borrowed time due to counter demographic performance and margin debt. Collective demographic trends in USA, China and Europe are not in favour of stocks or real estate, nor pro-government bonds. Price deflationary trends are in place, which means falls are likely to be hard in nominal terms for risk assets. 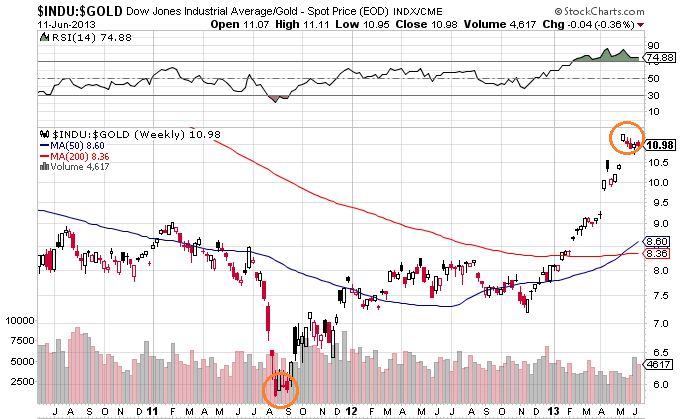 Commodities may not escape this, unless they are initially speculated to a peak and then join the falls. We don’t really have a precedent for such a coming together of trends, but I believe gold should be the winner as bonds, equities and real estate are counter demographic and cash is unattractive under ZIRP. I want to short stock indices from USA, China or Europe, but want to play long Japan, as it is the demographic exception. Brazil and India are also positive-demographic, but are not likely to escape a sell-off. I want to add long there post-falls. I will remain short treasuries and long precious metals. I stated at the top of the post that I believed this analysis to be just in time. By that I mean I suspect equities could fall hard at any time, and that’s the position I want to add to my portfolio: short stock indices. I can now see more of a case why US equities could be in an eiffel tower formation and about to collapse. So I am going to add short without delay. If China liquidity and emerging market issues don’t escalate this week and set off sharp declines, then I would ideally still like to see a more regular topping process with another attempt at highs before rolling over, over the next couple of months. I remain of the view that a topping process has begun in the SP500 and that it should take several months to play out in a volatile range. A new marginal high on negative divergences would be normal, so if an ABC correction did occur we should still then see a return to the highs. Outperformance should transfer to commodities, whilst this takes place, and maybe the breakout in oil is the first key development in this. The Bradley turn for equities is 22 June and gold seasonals take off as of mid-June. The demographic data points in the chart are 5 -yearly but a more detailed view of the M/Y ratio for the USA reveals a flattening from 2014-2019 and a true bottom and pick up from 2019. That would suggest a bottom for the Dow-gold ratio in that 5 year window, but with a bias towards 2019. However, ‘secular’ bull markets have typically historically peaked around solar maxima, which could bring the bias back towards 2014 (if the solar peak is this year). However, the projected window for a Dow-gold ratio bottom widens to 2014-2022 (again viewing more detailed data than my 5-yearly above). Furthermore, from here forwards we see much flatter and also divergent demographics which may potentially spell a new era, in which more balance between gold and equities is maintained, with less wild swings between the two. The FTSE-gold top around 1965 matches the demographics top. 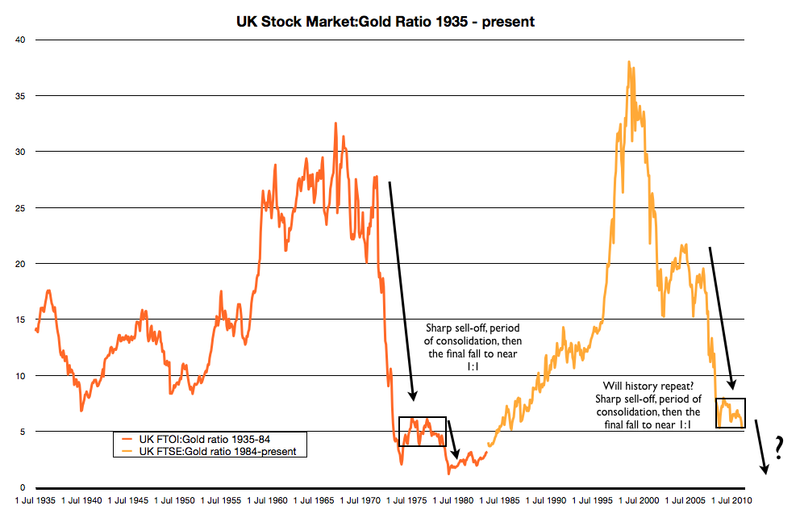 The FTSE-gold bottom 1975-1980 matches the demographics bottom. The FTSE-gold ratio topped in 2000 around 5 years before the demographics topped, and I would suggest the US influenced this. 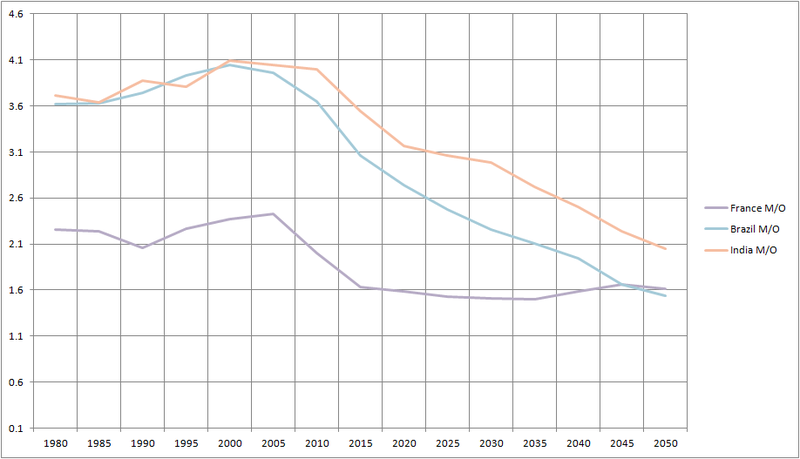 The bottom for UK demographics is from around 2020-2025. Drawing all together, I would suggest the likely window for the Dow-gold ratio to bottom is 2014-2025. As ‘secular’ bulls historically have ended close to solar peaks, then I would refine that and suggest the likely bottom for the Dow-gold ratio is either 2014 OR 2025 (based on solar peak projections of this year and around 2025). If the middle-young ratio is the more dominant demographic ratio for stocks-commodities then 2014 is more likely, both by US and weighted-composite demographics. However, gold would need to take off soon (and/or the Dow collapse) to enable that. Either way, going forward we might expect less long and less wild ‘secular’ swings in the battle between gold and stocks, based on flattening and divergent demographics ahead. We might rather find alternating cyclical bulls and bears between the two. By Russell Napier’s work, cyclical bulls in stocks historically end with yields rising and inflation troublesome. 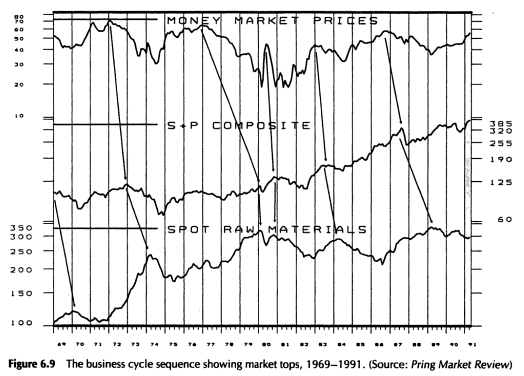 I see this as a fit with Pring’s work and my own, namely that we see equities rising, then yields and velocity, commodities become a beneficiary until inflation and yields start to tip leading indicators over and money exits equities, with commodities late cyclicals often rising into a peak once the business cycle has started to turn down. This, collectively, is the historic norm, and I believe we will see a repeat here, but it’s a question of timings. I believe we are at the start of a multi-month topping process in equities, that commodities are from here going to be the momentum class, and that money should continue to exit bonds. However, we do not yet see rising inflation and we only have 6 weeks momentum out of bonds, which suggests the whole process should take some time yet. That would ensure the missing inflation, but I suggest we may need one or more triggers to held generate such a move into commodities. I can only guess at such trigggers. One could be if crude oil can break out this time – as crude is an input in agricultural commodities and an important inflation driver, it could inspire price rises in both softs and gold. Another is the June 19 FOMC output, either sticking to or scaling back QE. The latter should create an initial sell-off but then I believe would translate into a faster flow out of treasuries and into commodities. On a personal note, since moving to Austria we have been living with the in-laws. We will finally move into our new place 1 July, and we are renting there with no plans to buy in the foreseeable future. We just sold our house in the UK at the end of last week which means I now have a large lump sum in the bank account at my speculative disposal, because it is no longer stuck in the housing market. I am going to take my time to work with it and work out how best to deploy it, but it clearly alters the status quo. It means I am flush with cash, but as a trader I see this as a golden opportunity to turn it in to something much bigger. In the short term it means I can and will want to be more aggressive with opportunities, in building up my exposure, so I wanted to share it with you to set the context when announcing future trades. From 1980 to 2000 investors had it good, with all three measures in strong rising trends. The current window, marked by the red box, is the opposite, with all 3 trending down, but as we are working on 5-yearly intervals in the data, it would be useful to be more precise, so here are the forecast turning points in the biggest economy, the US. In 2014 US net investors bottoms out its downtrend and turns into an uptrend; in 2019 the US M/Y ratio moves into a new uptrend; and in 2022 the US M/O ratio switches from down to up. That means there is a gradual turn around in US demographics over a period of years and that the current bull market since 2009 is counter trend. The key is whether the current strong bull ought to roll over into a bear market, and I believe it should, as all 3 demographic measures for the US are still currently declining. In the 1970s most of the 8 giants were in declining demographic trends and in the 1980s and 1990s most in rising demographic trends. That made for a fairly clear broad global bear market followed by a fairly clear broad equities bull market. 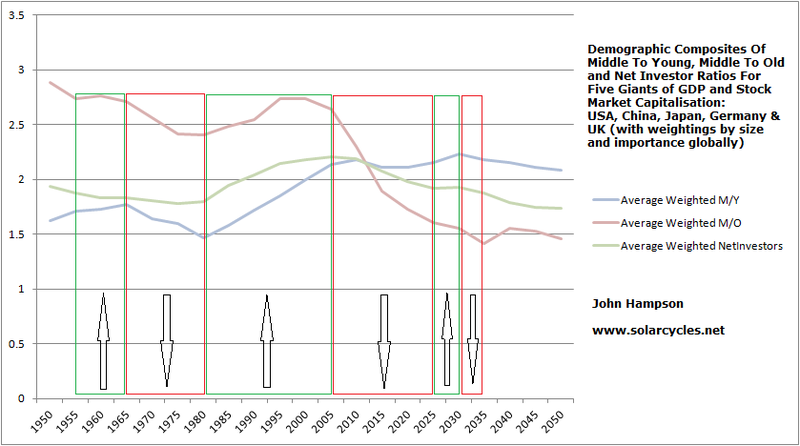 Going forward this is not the case as we have divergence amongst these leading countries and less compelling trends. As global stock markets continue to largely move together I think it is still more likely that we will have a ‘global’ bull or bear with some countries dragged along counter internal demographic trends. I feel fairly sure that the demographics of the US, still the most dominant economy and leading stock market, will be very important to the overall trend. To this end we can be glad that the USA is ending down trends in all three measures between 2014 and 2022, but what happens over the next few years whilst it bottoms out these negative trends is less sure. Japan’s net investor and MY demographics have been rising since around 2002, with the former due to top out by around 2015 and the latter by 2020. As Japan’s stock market has been suppressed until November last year I believe there is a good chance of a strong belated bull market here and certainly for the next couple of years. The threat to this is if the US market tumbles into a bear in line with its demographics, pulling down the world. Nonetheless I expect Japan to outperform so choose the Nikkei to load in on the long side. Meanwhile, France suffers the worst demographics trends forward out of the 8 giants. Here we see the three demographic measures of France versus Brazil and India. 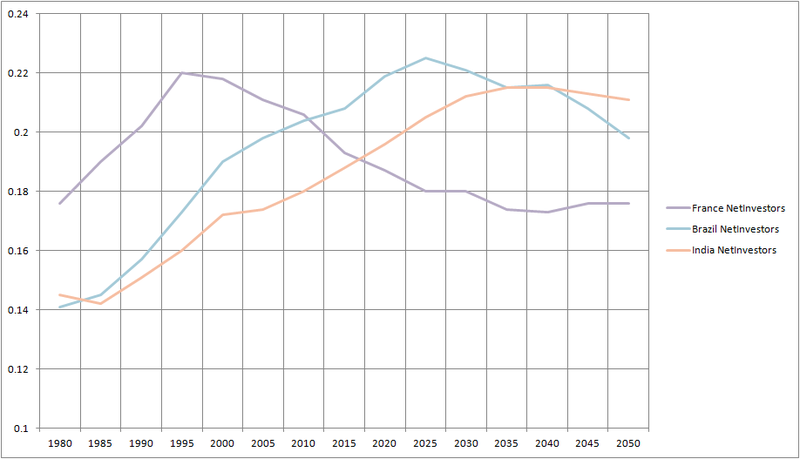 As of now all three demographic measures for France are trending down with no let up until around 2035-2040. 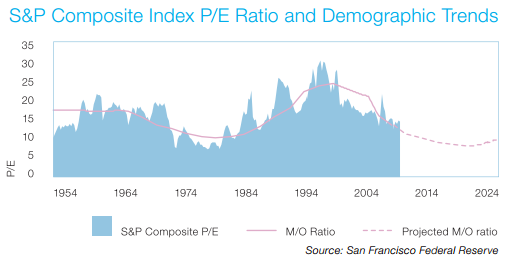 Additionally the CAC is on a p/e of 17 currently, one of the more expensive markets, with no demographic justification. I therefore see France as a good market to short going forward. However, right now there is evidence of a pan-Eurozone improvement ahead this year, with France’s PMIs turning up along with other Euro nations. I am therefore not convinced right now is the time to open short. However, I will be looking for the opportunity ahead. The best period ahead for a global bull market would appear to be from around 2022, at which point the USA and China become stronger again, with Brazil and India in support. Clearly that is some way off. 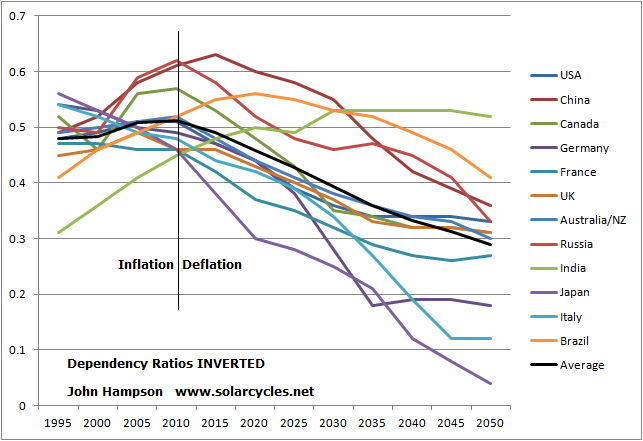 The next solar peak is likely to be around 2025, and should produce a secular peak in ‘something’. The work of the current solar peak is also likely not yet done, if the smoothed peak is still ahead. With all that in mind, I suggest these are the possibilities: (1) commodities go parabolic 2013-2014 and make their secular peak, taking stocks into a bear before stocks become the desired class again, led by Japan, Brazil, India (2) commodities only make an intermittent peak around this solar peak and make the secular peak around 2025’s solar peak, making for a 2 solar cycle commodities bull (supported by global wierding, global population growth) with equities in an extended global bear, (3) Japan equities go crazy and makes a truly rapid bull market to exhaustion closely following this solar peak (belated take-off, ferocious climb, premature exhaustion versus demographics) or (4) Japan makes a 13 year bull market and peaks around the next solar peak, extending its run to a few years after demographics have turned, i.e. a greed peak again. I am now of the mind that there is a complex interaction between demographics and solar cycles bringing about what is more commonly known as ‘secular’ bull and bear markets in equities. We need to understand the demographic trends of the main countries (those of major GDP, stock market capitalisation and population in the world), whether these are broadly trending together or divergent, and when the trends change. We also need to know when solar peaks fall, as demographic trends peaks that fall close to solar peaks are likely to be brought to an excitement maximum around the solar peak. We also know that solar cycles influence birth rates and thus demographics, adding to the complex interaction. Because collective demographic trends then turned down from circa 2005 and are not projected to bottom for a few years yet, I suggest the current global rally in stocks is likely on borrowed time, and that there is the possibility of a global bear market in play from 2007 through to either around 2020 or 2025. There is a window of demographic respite from around 2025 to 2030, but then the three measures are united negative again from around 2030 to 2035. I have broken down the three demographic measures below. Net Investors is collectively in a downtrend from here onwards. 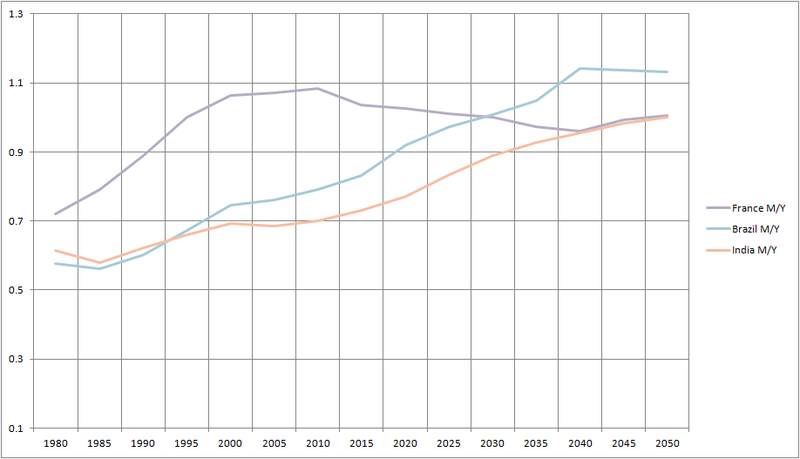 However, Japan is good right now, and several of the countries enjoy an up move from around 2025 to 2030. The collective Middle To Young ratio is more healthy going forward, but rather flat overall. Japan again shines now. 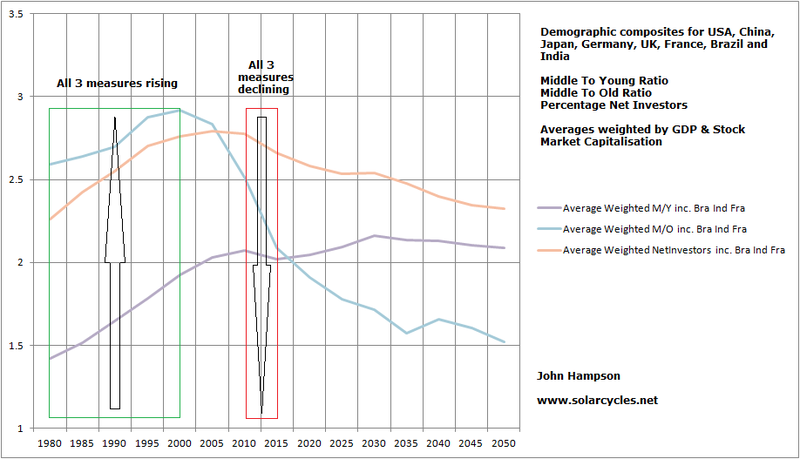 The Middle To Old ratio is overall rather dire for the next decade, but there is a collective improvement from around 2030. In summary, the current global stocks rally ought to come to an end as it is counter demographic trends, i.e. 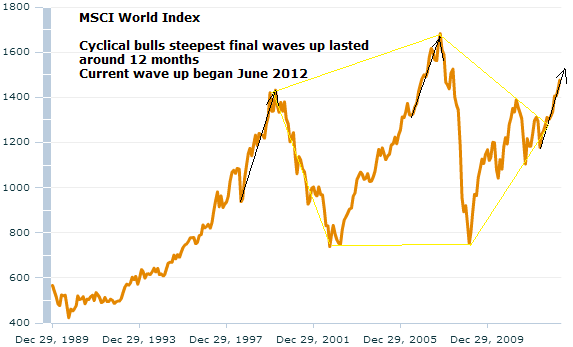 it is unlikely to be a new ‘secular’ bull market in progress. However, within that Japan has the demographic trends to justify such as bull market for itself, and its take-off in November 2012 was belated by demographics. Therefore I expect Japan can carve out more gains, but that the other major nations are more likely to tip over into a fresh equities bear in due course. As global markets tend to move together I don’t expect Japan can go its own separate way, but rather that it will outperform the others as markets move up and correct less than the others as markets move down. Returning to the first chart above, there is the possibility of an overall global bear market in stocks lasting until circa 2025, which is likely to be the next solar peak (or thereabouts). If that were to occur then commodities could potentially only be at an intermittent peak currently, heading for a ‘secular’ peak around 2025’s solar peak. Food for thought. 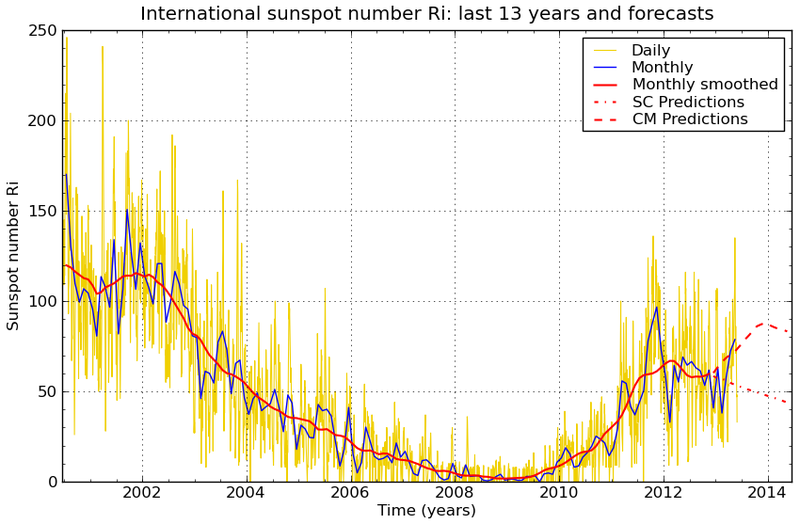 NASA now estimates the solar peak to be ‘summer 2013’, which is line with Jan’s latest. As forecasts are still being amended by both SIDC and NASA, we will just have to see how sunspots develop, but the key for me remains whether February 2012’s peak-to-date can be beaten. 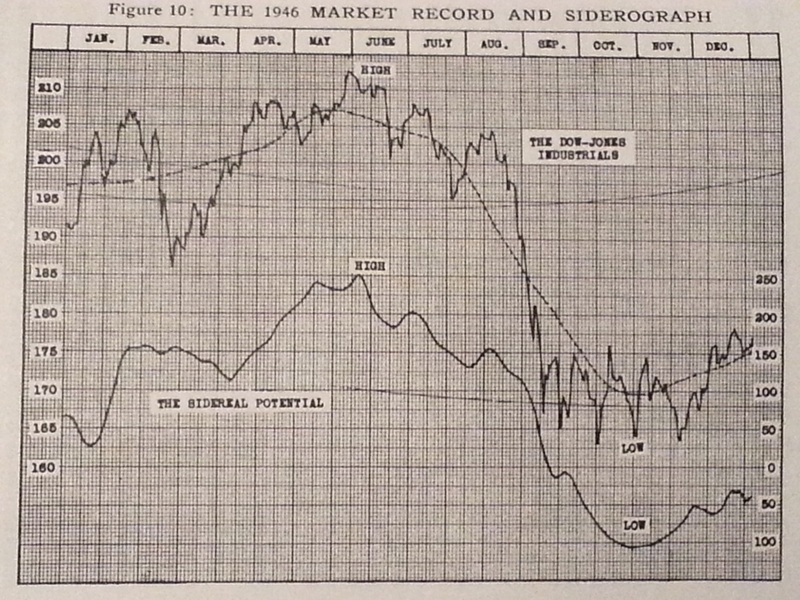 My suggested mirror from history is 1946-7, into the solar peak, treasury yields reverse course from ultra-low. Here is the Bradley model for 1946 courtesy of WX Guru. A similar model to this year’s Bradley, with a peak in June. I still foresee commodities rising and outperforming as stocks lose momentum and the USD weakens. Leading indicators suggest emerging markets and Europe should outperform going forward, which should bolster commodities and the Euro. I have added to long sugar today. It has been languishing on oversold and overbearish readings for some time now. That does not mean a turnaround has to happen. But it has pulled back sufficiently for me to want to add. I have also added to long Natural Gas today. It has pulled back from having reached over 4.5 dollars to just under 4. It is still at historic cheapness and relative pricing to oil. 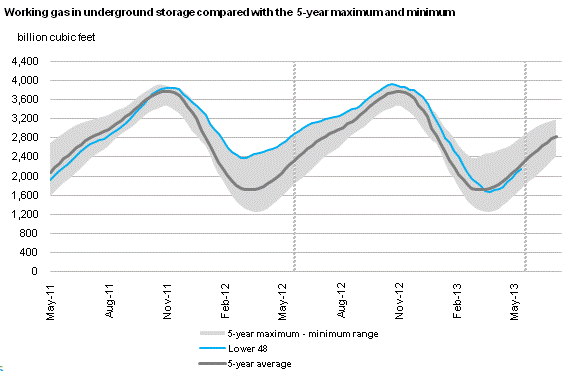 Plus it is in a better position in terms of inventories compared to crude. And lastly today I have opened a long position in the Poland WIG stock index. Here is is modelled against the latest geomagnetism update. Geomagnetism has changed significantly over the last month, from benign to troublesome. I believe this has been a factor in stocks pulling back. As can be seen, the geomagnetism forecast for the next 3 weeks is not good, but I wanted to open a position in the WIG and it is just a starter position. With a current reasonable p/e of 12 and a likely improvement ahead in Europe, I decided to start that position today.